We worked hard to create condensed, concise courses, focused on results. Klos Training commissioned Profitable Insights, London, to review the quality of their courses as evaluated by participants. The evaluation forms at the end of each training represent an accurate tool for monitoring the quality of training services. This is one of the many ways in which the company sustains its quality management system. According to ISO 9000 principles, the purpose of quality management is to meet clients’ requirements and to strive to exceed client expectations. Klos Training has been improving the communication and presentation skills of corporate employees in Poland since 1995. The team at Klos Training have regularly collected evaluation forms from presentation and communication skills courses in order to monitor trainers’ delivery and clients’ satisfaction with trainings offered. Klos Training also commissioned a statistical review of the consistency of item ratings and the link between items and outcomes with a London-based analytics company Stillae in 2013. As a result of the analysis, self-efficacy statements i.e. participants’ confidence in their ability to communicate and present effectively, and items related to relevance for job were included as important outcomes of training quality. This report includes the review of the new and calibrated evaluation forms from over the last three years and uncovered consistently high ratings of all aspects of training delivery. Participants rated the quality of courses, including usefulness of content for their day to day job and level of confidence in speaking and presenting in public as a result of their attendance. Klos trainers were also highly rated for their ability to increase the confidence in participants’ ability to perform better in their job when it comes to communicating effectively. 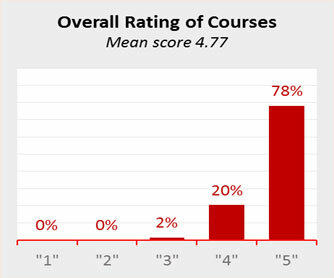 Klos Training courses obtained a 4.77 overall rating for quality. The evaluation forms use a standard Likert scale ranging from 5 ‘excellent’ to 1 ’poor’. As defined above, quality is also measured by the service’s ability to meet requirements. In educational services meeting learners’ expectations is an important requirement. Participants have a set of expectations prior to the learning experience which determines their learning capacity to absorb knowledge during the course and increased probability of applying the knowledge post-event. 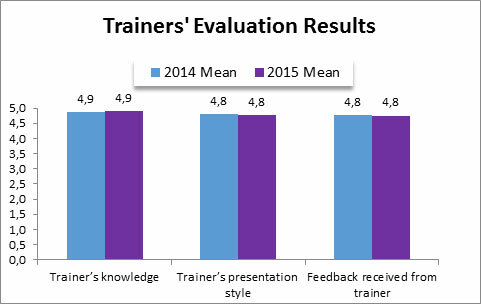 Klos Training obtained a mean of 4.70 rating for meeting expectations of participants, where 5 is best. Klos Training uses an internationally recognised standard of customer satisfaction, the Net Promoter Score (NPS). 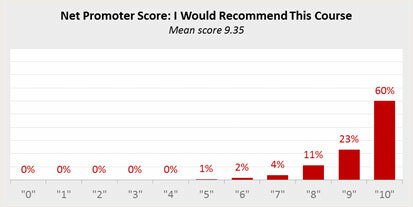 NPS measures the level to which clients would recommend the service to colleagues and others. It was pioneered by Bain & Company because high scores on the NPS question correlate strongly with repurchases, referrals and other actions that contribute to a company’s growth. NPS uses a scale from 10 ‘excellent’ to 1 ‘poor’. The percentage of clients who score ‘9’ and ‘10’ represents a measurement of how many Promoters – loyal and enthusiastic fans – the company has. Klos Training obtained a mean score of 9.35 on this standard and a total of 83% of course participants are Promoters. The ultimate outcome of corporate training is to improve ability to do your job well. The more relevant to their job the training is, the more likely participants are to make use of the knowledge they acquire, practice what they learned, and consequently improve their skills further. A lot of the jobs in corporate environment, ranging from sales to any managerial position, require the ability to convey information efficiently. Consequently, training in communication and presentation skills can impact job performance directly. The impact on job performance for Klos Traing courses is measured through ratings of usefulness on the job, appreciation of course content and the practicality of the course delivery method. 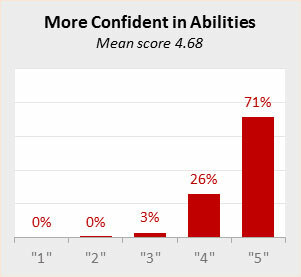 Usefulness on the job obtained one of the highest ratings – a mean of 4.74 where 5 is the best. It is therefore to be expected that, where the job required the ability to communicate, attendance to a course has a direct impact on job performance. A high result in usefulness of courses on the job is possible by the mix of high quality content with practice. The combination of exercises, video-taped presentations and feedback sessions creates a highly active and practical course for participants at Klos Training courses. Participants see rapid improvement in their presentation style over the sessions. Additionally, the presentation skills course is co-trained with a professional voice coach. Building confidence in a learner’s ability is key for educational success. This is known as self-efficacy and represents the extent or strength of one’s belief in one’s own ability to complete tasks and reach goals. Low self-efficacy can lead people to believe tasks to be harder than they actually are. This often results in poor task planning, as well as increased stress. As presenting in public is an especially stressful task, any increase in self-efficacy prompts participants to take more risks, practice more and therefore improve their skills faster. The review of Klos Training evaluations shows that increased confidence in the ability to communicate effectively is linked to the overall satisfaction with the course and is appreciated highest by the participants. The self-efficacy item obtained a mean of 4.68 where 5 is the best. Self-efficacy may also contribute to participants’ stated wish that the learning experience were longer. Although on a market that is pressured to shorten the duration of courses, comments of participants at Klos Training programs often indicate that they would like longer courses. These comments are a genuine reaction to the high quality they experience when attending Klos Training courses. Klos Training clients work in a globalised world in which English is the language of business. Speaking and presenting in public is hard enough. When participants need to present in a second language, they can no longer rely on the speed and spontaneity that their native language may give them. The fear to speak up because of possible mistakes increases and adds on top of any existing fear of public speaking. Klos Training, which was started by an American, offers their clients communication and presentations skills in English too. The trainers are native speakers. Participants can get a double benefit – improve their communication skills and practice English at the same time. 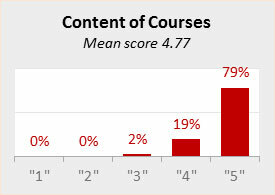 The courses in English were rated more highly than average overall. Additionally, the English courses manage to build a slightly higher level of self-efficacy in participants. 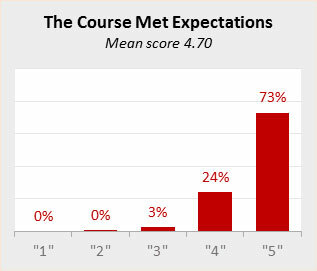 The highest ratings obtained for the courses delivered in English is a mean of 4.7 in self-efficacy (‘more confident in my abilities’) compared to a 4.68 mean overall. 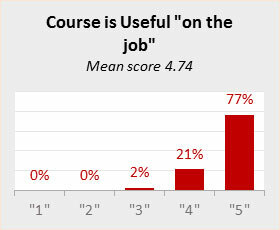 Meeting participants’ needs and usefulness on the job for these courses were also higher than overall average. Klos Training offer includes, beside presentation skills, structured communication, writing, customer service and job engagement skills. The best ratings were obtained by the content of the presentation skills courses. 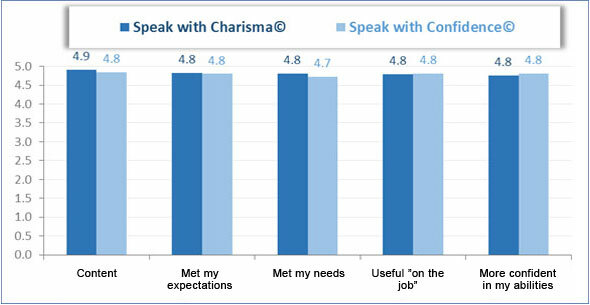 Two of Klos Training courses – Speak with Charisma© and Speak with Confidence© – received constant higher ratings for meeting participants’ expectations and needs, how useful the trainings will be on the job and how they contributed to increasing participants’ confidence in their ability to present effectively. As Klos Training offers mainly classroom based courses, the quality of courses depends highly on the quality of trainers and their skills and ability to engage the audience. Klos trainers get consistent overall ratings of their style and knowledge when it comes to speaking and presenting in public courses. Participants would recommend them highly and greatly appreciate the feedback they receive during courses. Trainers scored a higher NPS than the overall score for courses – a mean of 9.4 out of 10. Their scores are consistent year on year – a mean of 4.9 out of 5 on knowledge and 4.8 out of 5 on presentation style and feedback offered to participants.